This week's Pattern Design class is all about colors. Exercises for today was to create some color palette from photos. Since it's Tuesday, I figured I would find some tea cups or tea sets. This will work for both Elizabeth's T(ea) for Tuesday and the design class' exercises. Besides who wants to see a cup with plain old water 'cause that's all I had this morning after my oatmeal breakfast. Here's a photo I found from pinterest. Here's another that I did for a challenge at the colourlovers site quite a while ago. The photo was a Mike Worrall's Quest For Symmetry. 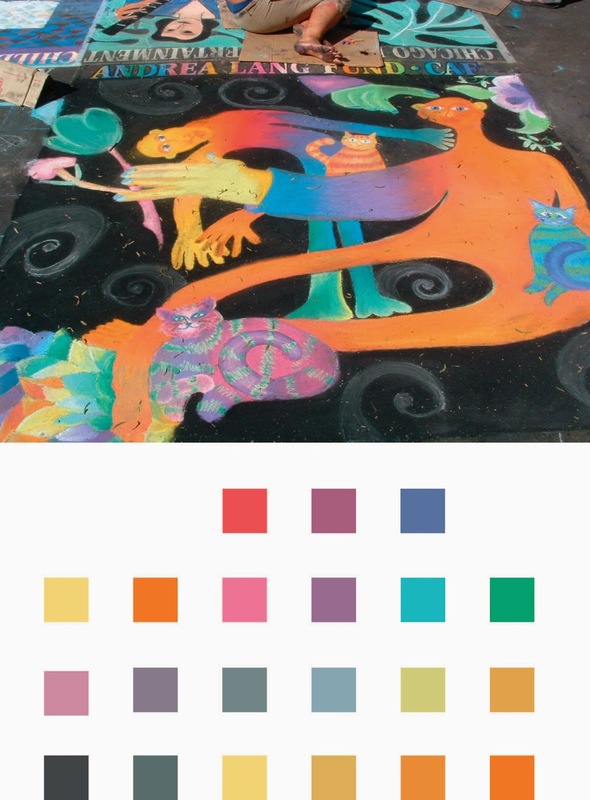 I haven't been to the colourlovers site for quite a long time. They have a tool to create patterns as well and you can color it with your won palette or someone else and credit will be link to that person. It was a really fun site. This third one is from the Santa Barbara side walk chalk event from LONG time ago when the kids were young. It's funny looking back at these palettes and see how I organized those color swatches. Or rather in this case the lack of organization. They are just all over the place. Well, time to hop over and see what the rest of the T(ea) for Tuesday gang is up to. Happy T Day to you! Thanks for stopping by. Well at least it looked like all the snow is gone for you folks. Hope there is no more freak snowstorms till next winter. The third color palette is my favorite as I think I gravitate towards bold and bright! Thank you for visiting me on T Day and for your nice comments on my beaded flowers. Oh you are welcome and thanks for stopping by. Hello and Happy T Day!! I love that first picture and pretty colors!! The other two are great too but that first one is my favorite. I like the idea of making color palettes, always fun to play with colors. Thanks Dawn. Playing and changing the colors around can be quite addictive. Love the cups and Bleubeard loves the sidewalk art. The middle one may be my fav, since it reminds me of an artist although I can't remember her name. Have you heard of ROY G BIV? I think that's how the color palette is supposed to be laid out, but what do I know. I don't do color palettes. I can even spell it right, although spell check does a good job of correcting me (grin). 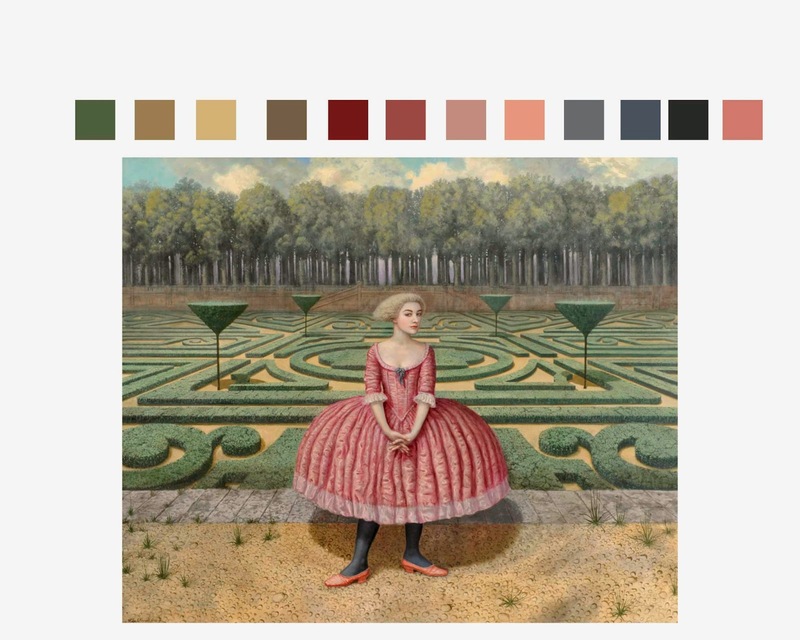 Thanks for sharing your color palettes (yep, got it spelled right this time) and lovely art with us this T Tuesday. I'm SO impressed that you chose some color this week. ROY G BIV - colors arranged in the order of decreasing wavelengths. : ) I had to look that up but thanks I learned something today. Thanks for stopping by (and hosting T for Tuesday). Really gorgeous tea cups! love those colors...thanks for the info on the colourlovers site...haven't visited it before so think I'll check it out! Love to share. But be warned, that site is addicting if you like colors and patterns. It's fun seeing the color swatches along with the photos. Love those petty colors of the teacups. Thanks Linda and thanks for stopping by. I do like those cups and saucers. I cannot remember drinking out of a cup and saucer at home for such a long time! Thanks for stopping by. We never use a cup and saucer. We are VERY informal at home. Lovely! Especially the colorful tea cups! Great photos and the color palettes or swatches included make it so interesting. Fun to see the square of color and refer back to the photo. Thanks Darla. It's always fun playing with colors. Oh, I do love those cups and saucers! I like having a variety to drink out of, but I don't end up with much pastel for some reason. Googling now... Ok, I'm back, and the pattern is Colclough Harlequin Ballet and not even all that expensive. Sweet :) Thx! Thanks for popping by Tuesday for Tea, sorry I am so late in getting around to returning the visit. I am so glad I did, cause I took a good nose around, and just love the things you have done. Your 29 faces are fantastic as well as your other art. 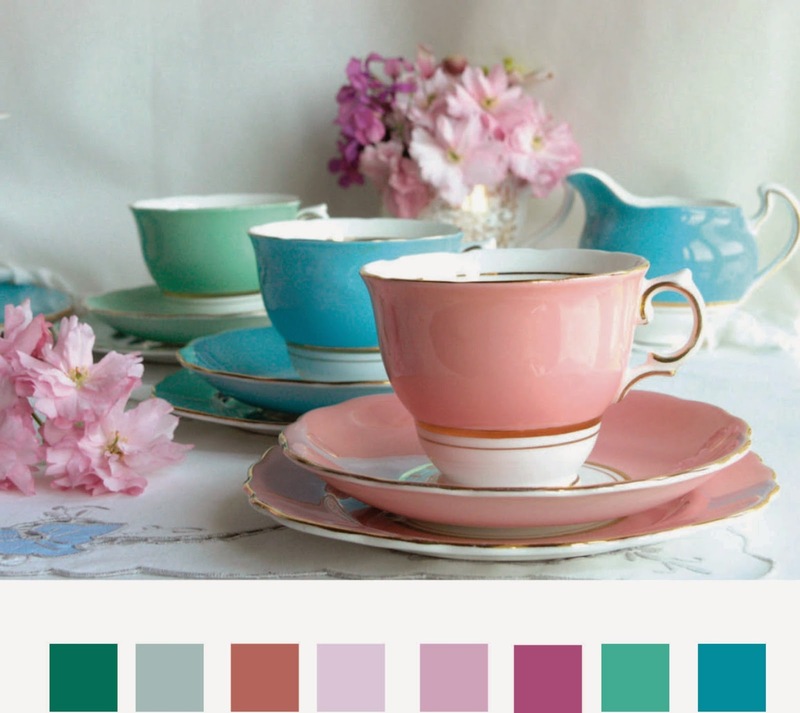 omgosh I l♥ve the color of those tea cups! and all of your photos really...color is a never-ending adventure!